Reductions in lubrication, chain take-up, and machine positioning adjustments. 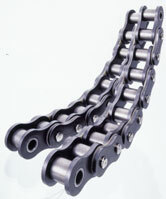 Decrease in faulty product ration, reduction in chain replacement. Attention: Inner plate is thicker than Standard RS Roller Chain. Also, due to the insertion of the Felt Seal the pin is now longer (L1, L2). Please check for any interference.